Horses. Magnificent horses. Beautiful Arabian horses. Galloping, almost floating, fast and free across the desert, tails flying. Moving with fluid beauty, grace and endurance. That was when the passion for these desert horses began. Although the Marshalls and Gleannloch Farms have passed into history, their contribution resonates through the Arabian horse world to this day. Douglas and Margaret Marshall shared a long and happy marriage, a fascinating and exciting life, and a deep commitment to Arabian horses. 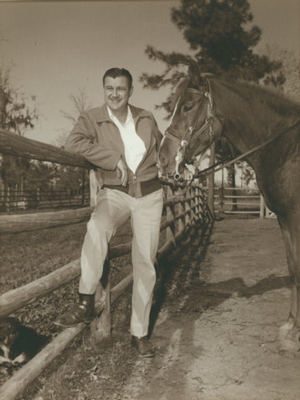 The Gleannloch Farms Arabian Stud grew out of their lifelong love for horses. Margaret grew up around horses. 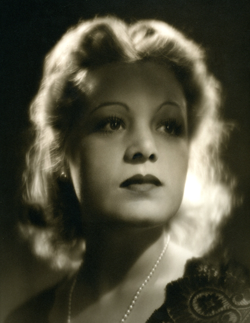 Her father, Hugh Roy Cullen, “the king of the Texas Wildcatters,” was an industrialist, oilman, philanthropist and founder of the 14,000-acre ranch Rancho Cullen, near Columbus, Texas. 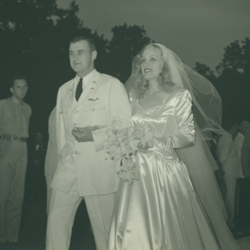 He survived, transferred back to Texas and in the spring 1945, Doug and Margaret Marshall were married. 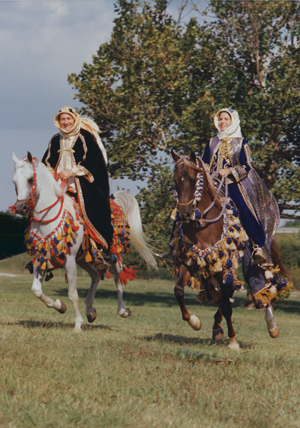 In the late 1940s and early 1950s Arabian horses in the United States were exceedingly rare. The Marshalls would hear about an Arab horse, travel miles to see it, but no one would sell. 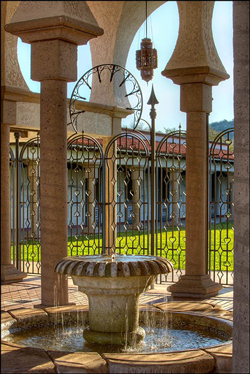 Finally, they prevailed on Dan Gainey, who owned 38 Arabians, to let them have one –Fa Gazal. In 1954, she was bred to the stallion Moneyn, owned by a neighbor, and in May, 1955 they had their first filly, Kahla. While Douglas and Margaret were busy congratulating the mare, the filly ate the back seat of their convertible! Years passed and their passion for Arabians grew, as did their stable and its reputation. Kahla was a halter winner in 1960 and dam of U.S. Top Ten Mare Surur, and her full sister Bint Surf, 1968 U.S. Reserve National English Pleasure Champion. Over the years more brilliant horses arrived and as time passed it became clear that an excellent trainer was needed. The Marshalls discovered distinguished breeding horses both in the US and abroad and developed a reputation as an Arabian breeding and showing farm. The farm also produced award-winning Aberdeen Angus Cattle. Doug Marshall took an active role in the leadership of the Houston Livestock Show and Rodeo, eventually serving as a director, Vice President, President and Chairman of the Board. 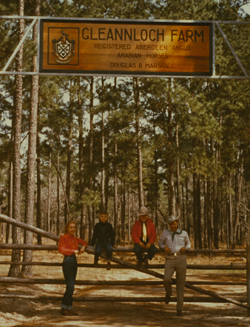 In 1959 the Marshalls recruited a talented training team in the form of Tom and Rhita McNair who arrived from Virginia with their young son Dan at Gleannloch Farms in Spring, TX. Doug and Margaret had accumulated contiguous farm properties, a parcel at a time, so that when the McNairs arrived, Gleannloch had expanded to approximately 2,500 acres in two separate farms. Tom and Rhita each brought their own particular kind of genius to the Gleannloch operation. Tom’s was his eye for a great horse, his understanding of the Arabian horse temperament, and how to show them at their best. Rhita’s was in directly relating to the horses, helping them become comfortable with crowds, a skillful hands-on trainer. Both were wonderful riders, she was a good business person and together with the Marshalls they helped Gleannloch become a stable full of star-quality horses. Within a year of their arrival, Gleannloch horses were making a substantial impact on the show ring. Surf was their first “star.” It is safe to say that without the McNairs, the history of Gleannloch would have been very different. Over the next 10 years, the Farms and the horses grew in renown. 1960 was the first year that Gleannloch horses made their first notable impact on the show ring circuit, including shows at Scottsdale, Houston (where the Marshall’s son, Doug Jr. won the junior rider class), and Nacogdoches (where he placed first with his own filly, Sabiyi). At the big show in Seguin, Texas, the soon-to-be-famous Surf won the trail horse class, English pleasure, western pleasure stallions, and the western pleasure stakes. The reputation of Gleannloch horses was off and running. Surf went on to win many, many trophies. The McNairs ran the showing operation to perfection, and Margaret and Doug Marshall continued the search for horses. In time both of the Marshall’s sons, Doug Jr. and Hugh, upheld the family name in the show world and Tom and Rhita and their children Dan and Maggie were also staples of the show circuit. Numerous wonderful horses such as *Moftakhar, *El Thabi and many more came to live and breed at Gleannloch Farms. The full story of the breeding program, the dedication and the decades of work that created the outstanding Gleannloch Arabian bloodlines, and of the decision to focus exclusively on Egyptian Arabians will be told as this website continues to grow. When the growing sprawl of Houston encroached northwards to the area around Gleannloch Farms at Spring, the Marshalls began to look for a more secluded home. The search led them to Barksdale. Margaret discovered the history: “The Indians used to follow the buffalo down here from Wyoming, spend the winter here, and then walk back. The Indian mounds on our land go back 10,000 years.” Doug and Margaret enjoyed collecting arrowheads from all over the property, every year they lived there. According to Doug Marshall it took five years to build the house and four years to build the stables. They had taken pictures of buildings on their travels to show their architect what they wanted and were especially taken with Arabic and Moorish architecture. The Marshalls decided to call the new property “Las Palmas,” because they loved palm trees. It turned out that they grew exceptionally well in the area, making the Gleannloch camels feel at home. Las Palmas was designated a game preserve and also had flocks of wild turkeys, about a dozen peacocks and peahens, and several species of deer which grew into large herds. While much of the breeding operation continued at Gleannloch at Spring, the Marshalls were creating a home and stables of extraordinary scale and beauty – the fascinating and palatial Las Palmas. Besides their many trips to the Middle East, the Marshalls loved to travel and particularly enjoyed Austria, especially Vienna, Germany, and Switzerland. They established a second home in Canada, an island retreat in Lake of the Woods, Ontario.